Kickoff Returner lets you play a kickoff return specialist, charging up a football field and dodging opponents, trying to get into the end zone. This is not a full football simulation, just providing that one specialist play. 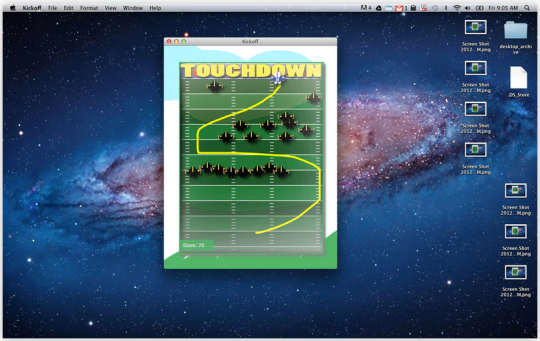 There's a free version of Kickoff Returner as well as a full version for $1.99. 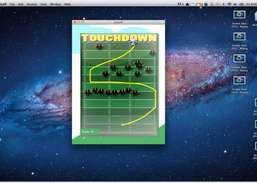 When launched, Kickoff Returner shows a schematic of the football field from overhead, with opponents represented as helmet-and-shoulder silhouettes. Your task is to start running up field, maneuvering around the opponents who are all out to stop you. Moving your runner with the mouse or keyboard, you zig and zag, while the opponents adopt some basic football formations to halt your progress as quickly as they can. While Kickoff Returner can be challenging, the limited gameplay will be an issue for some. The graphics are rudimentary, too. Beat the opponent with fancy lethal shots such as dragon shoot and win the tournament.